Access to FmPro Migration Service - Microsoft Access to FileMaker Pro by .com Solutions Inc.
".com Solutions Inc. FmPro Migrator automates Access migrations to FileMaker Pro"
FmPro Migrator Platinum Edition 8.73 - Adds support for FileMaker Pro Advanced 17. 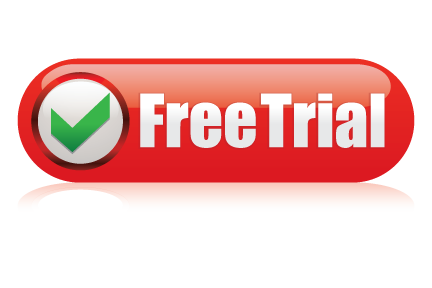 Fixed-price service, keeps your Microsoft® Access to FileMaker Pro migration project affordable. Process your files locally, using FmPro Migrator Developer Edition. Automated conversion of Microsoft Access Forms/Reports into FileMaker Pro Layouts. Visual Basic code is converted into FileMaker Pro scripts and linked to Layout buttons. Grouped radio buttons/checkboxes are converted into FileMaker fields with Value Lists. Access database relationships are converted into FileMaker Pro relationships. Embedded Access Value Lists are de-duped and converted into FileMaker Value Lists. Embedded Form/Report images are converted directly into embedded FileMaker Layout graphics. Converts Access SQL Queries into FileMaker Scripts. Supports converting Microsoft Access 2000, 2003, 2007, 2010, 2016 database files into FileMaker Pro 11 - 17. The Microsoft Access to FmPro Migration Service included with FmPro Migrator Platinum Edition provides a fixed-price conversion service for migrating Microsoft Access .mdb/.accdb database files into FileMaker Pro database files. This service includes the conversion of Forms/Reports, Relationships, Queries, Value Lists and Visual Basic code within a predefined budget. FmPro Migrator Platinum Edition includes an Access to FmPro Qty 250 License Key - Unlimited Number of Database Files - (1 Year Duration). 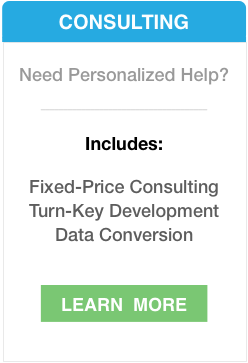 Access to FmPro Conversion projects can also be performed as either Turn-Key or Fixed-Price Consulting projects. Fixed Price Service - You know up front what the cost will be to convert the Forms/Reports, Relationships and Queries layouts from your Microsoft Access database solution into a new FileMaker Pro database file. Pricing for the migration service is based upon the number of Forms/Reports which need to be converted. There is no additional cost for the conversion of an unlimited number of Microsoft Access Visual Basic code modules into FileMaker Pro ScriptMaker scripts. Upsize Access Databases to FileMaker Pro - Microsoft Access database files are limited to a 2GB maximum file size, 255 fields, and a 64K procedure size limit. Furthermore, Access Forms/Reports cannot contain more than 754 controls - during the entire life of the Form/Report. FileMaker Pro 10 databases exceed all of these limitations by a wide margin, while providing legendary ease of use and cross-platform compatibility. Save Time, Get Up and Running Quickly - It can be a tedious and time consuming process to manually re-create each Access Form/Layout control into any other development environment. Rather than spending days or even weeks of valuable time manually converting hundreds of Forms/Reports, FileMaker developers can utilize the Access to FmPro Migration Service as an economical alternative. FmPro Migrator Developer Edition typically processes each Form/Report in a fraction of a second - much faster than you could perform the task manually! The ability to efficiently perform Access to FileMaker Pro migrations makes it possible to quickly show prototypes to prospective customers. An automated migration process represents the ultimate in rapid application development, which can't be matched by any other development environment. Being able to show customers a rapid prototype may make the difference in getting approval for a new client project. Font Remapping - Access databases frequently utilize fonts which are not cross-platform compatible, since Access only runs on the Microsoft Windows operating system. Since the definition of the Forms/Reports are extracted into a text file, a FileMaker developer can simply perform a search & replace with a text editor to replace any operating system-specific font names within the AcessDDRExport text file. Visual Basic Code Conversion - Each Visual Basic Subroutine or Function is converted into a FileMaker script documented with the name of the original code module, and global variables, followed by the commented text of the Subroutine or Function. FmPro Migrator uses the clipboard script handling features included with FileMaker Pro 9+ to batch copy all of the converted scripts into the FileMaker Pro scripts window. The converted scripts will require further development and are intended to be used as a template for the development of new FileMaker script code to replace the original Visual Basic code functionality. Visual Basic scripts linked to Access form objects are converted into layout objects and also linked to the converted FileMaker Pro scripts. Relationships are retrieved from the Access .mdb/.accdb database file when the tables and fields are gathered during the initial drag & drop processing of the file. Access relationships are converted into FileMaker relationships during the conversion process. Each relationship is then built in an automated manner using AppleScript(MacOS X) shortcuts or WinAutomation(Windows) jobs. Being able to see the relationships at a glance on the FileMaker RelationshipGraph makes it easier to understand and utilize the structure of the original database. Microsoft Access radio button/checkbox groups consist of multiple objects within an acOptionGroup object. Access always writes a numeric value into the underlying database field whenever a checkbox or radio button is clicked. The numeric values are defined within each individual radio button/checkbox object. The text values seen by the user are defined as caption text within a text label object corresponding to each button. Objects which make up the group button are related to each other in a hierarchical parent/child relationship manner, which enables FmPro Migrator Developer Edition to traverse the object relationships and extract the data values and labels. In the diagram shown above, the 7 objects contained within the acOptionGroup radio button group are converted into 2 objects (field and label) and a value list assigned to the field on the FileMaker Pro layout. The size and rectangular shape of the converted FileMaker field corresponds to the coordinates of the original group button object rectangle. All generated value lists are de-duped and created as individual value lists. The correct value list is automatically assigned to the field on the layout, and the field is configured to display as either a group of radio buttons or checkboxes based upon its definition on the original Access Form. Access database fields can be configured with semicolon separated lists of text based Row Source values. These Row Source values serve the same purpose as FileMaker Value Lists, providing for the selection of text value entries into fields. Access databases do not contain a centralized storage location for these Row Source values. These lists of values are scattered throughout the Forms/Reports of the entire database file. FmPro Migrator extracts and analyzes the Row Source values for duplication prior to creating new Value Lists for the FileMaker database file. Therefore if a file contains dozens or even hundreds of Row Source value definitions, they will be consolidated down into a much smaller number of unique Value Lists within the Manage Value Lists window within FileMaker. Text label and field formatting attributes are read from the Access database and recreated within the objects placed onto the FileMaker layout. These attributes include: Font Name, Font Size, Foreground Color, Background Color, Font Style (Bold, Italic), and Text Alignment. Access Control Tip text is converted into FileMaker Tooltip Text for each object. Access fields having a Date Picker are created with a Drop-down Calendar on the FileMaker layout. Embedded Form/Report graphic images from Access acImage objects are placed onto each FileMaker layout in the same size and location as the original image. Each image is extracted from the Access database as a JPEG image and written into an Images folder during the AccessDDRExport processing. Having the images available as external files prior to building the FileMaker layouts makes it possible to substitute new images for the original images. As long as the filenames remain the same, FmPro Migrator will utilize the replaced image when creating the new layouts. Notes: Only embedded images within acImage objects can be extracted from the Access database. Images stored as a reference to a file on the file system will show up as an empty image object on the new layout. Also, images embedded within acCommandButton objects are not currently supported. Microsoft Access 2007 does a better job of matching the image resizing of embedded graphics images with the display of the same image within FileMaker Pro. Access 2000 database files will often display a cropped version of the image starting with the upper left corner of the image. Rectangle objects can be used as Form/Report backgrounds within Access. Filled and unfilled rectangles are converted, as well as the border properties. The color and thickness of Line objects is also converted, as shown by the purple and grey lines drawn across the colored rectangle. Line and rectangle objects from Access are converted directly into FileMaker Pro Line and Rectangle vector graphic objects. As vector graphic objects they are displayed at high resolution for on screen display and printing purposes. Access Tab Panel objects are converted into FileMaker Tab Controls, including the objects embedded within each tab of the control. Each type of object which is converted for the main section of the Form/Report is supported for conversion within each tab of a Tab Control. Microsoft Access Forms/Reports can include SubForms/SubReports, having functionality similar to FileMaker Pro portals. FmPro Migrator automatically creates a new portal to represent each SubForm found on the original Access Form/Report. FmPro Migrator divides the width of the portal by the number of fields on the original SubForm and creates each portal field of the same size. The fields are also created in the same left to right display order as they were displayed on the original SubForm. Each Microsoft Access query is converted into a Table Occurrence on the FileMaker RelationshipGraph, since a FileMaker TO represents how the query is used within the structure of the Access database. Layouts and Fields on Layouts will immediately display the data referenced within the base table specified in each of the TOs. Access queries are also converted into FileMaker scripts which use the DoSQL plug-in from myFMButler/SHPartners. These scripts are pasted directly into the FileMaker Manage Scripts window, along with all of the converted Visual Basic code. Having the source code for each query enables the FileMaker developer to configure relationships representing the functionality of the original SQL query. Access Forms/Reports often include calculated fields which consist of completely calculated values or database field values combined with calculated values. Since the field data source does not translate directly into an existing field name, the FileMaker layout will designate the table/field as missing. In order to prevent the calculation formula from being lost during the conversion process, FmPro Migrator appends the text of the calculation formula to the end of field's tooltip text. The text can easily be copied from the tooltip and used within new calculated field definitions or scripts. Due to the complexity associated with any database migration project, it is recommended that a small test project be completed prior to starting the full conversion project. By default, FmPro Migrator Developer Edition processes Access to FmPro migration projects in demo mode without a license key. In Demo mode, FmPro Migrator Developer Edition will process 5 Forms/Reports and 5 Visual Basic scripts. Using the demo mode at no charge, enables FileMaker developers to become familiar with the conversion process and see the converted Layouts in the FileMaker database. AccessDDRExport.zip - This file is written to the local hard disk when opening the Access to FmPro Migration Service window. This within this zip archive is a dll file and two versions of the AccessDDRExport accde/mde database file. This file is used to extract the information from the Microsoft Access database in preparation for migrating the contents of the database into FileMaker Pro. FmPro Migrator Platinum Edition - The Access database file is dropped onto the FmPro Migrator Developer Edition Step 1 button in order to read the tables/fields and relationships from the Access database. FmPro Migrator Developer Edition reads and processes the AccessDDRExport report file along with the extracted images. Tables/Fields and ScriptMaker scripts generated by FmPro Migrator are copied into FileMaker Pro via the ClipBoard. In demo mode, FmPro Migrator Developer Edition will convert 5 Forms/Reports and 5 Visual Basic scripts into FileMaker Pro database. Buying a license key for the Access to FmPro Migration Service provides full-featured migration of the quantity of Forms/Reports ordered along with an unlimited number of Visual Basic scripts. This license key enables the processing of the specified quantity of Forms/Reports for an unlimited number of Microsoft Access database files for the duration of the license key [30 days]. This import process follows the steps detailed in the Access to FileMaker Pro Migration Process PDF file. FmPro Migrator Platinum Edition may also be used by the FileMaker developer to perform the conversion of the Access database tables and data FileMaker Pro. FileMaker Pro Advanced 11+ - FileMaker Pro Advanced is used for copying the structure of the tables/fields and scripts via the clipboard into the FileMaker Pro database file. The FileMakerDB.fp7 standard file created by FmPro Migrator serves as the empty database used to create all of the Tables/Fields, Relationships, Queries, Value Lists, Layouts and Scripts converted from the Access database file. The FileMaker Pro ODBC driver is used for copying the database records from Access into the FileMaker Pro database file. Microsoft Access 2000, 2003, 2007, 2016 - The version of Microsoft Access required must be at least Access 2000, in order to support the execution of the AccessDDRExport accde/mde file used for extracting information from the source Access database file. AppleScript- AppleScript is used for automating the creation of Relationships, Value Lists, Layouts within the FileMaker database on MacOS X.
WinAutomation - A compiled WinAutomation job file [provided at no cost] is used for automating the creation of Relationships, Value Lists, Layouts within the FileMaker database on Windows. Actual Technologies Actual ODBC Driver for Access - The Actual Technologies Actual ODBC Driver for Access used used for reading database structure and data from the source Access database on MacOS X. The Actual ODBC Driver for Access is the only ODBC driver capable of directly reading the relationships from within Access 2007 .accdb database files. myFMButler/SHPartners DoSQL Plug-in - This plug-in is used to execute the converted Microsoft Access SQL Queries within the FileMaker database. 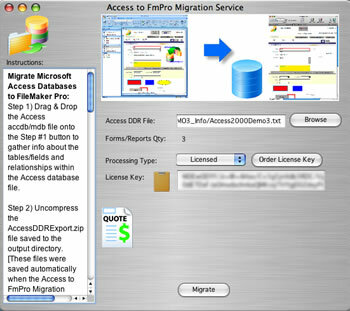 The Access to FmPro Migration Service utilizes FmPro Migrator Platinum Edition along with the other software listed here in order to convert the Access database objects and automates the creation of layouts, relationships, value lists and scripts within the FileMaker Pro database file. Vertical positions of each report section are exported and the enclosed objects are created in the correct locations on the FileMaker Layout.